Before the arrival of the Europeans in New Zealand the Maori relied greatly on the flax plant (phomium tenax) for their everyday needs. The Maori women scraped flax by hand using sea shells to remove the fibre from the green leaf. The fibre was then processed into mats, kits, clothing and rope. Also juices or gum were well regarded by Maori for their medicinal purposes. Soon after the European arrival flax became the raw material of the developing industry of rope making. From the 1840s rope walks using flax fibre produced by the Maori were established in the Foxton/Shannon area. In 1869 Mr C. James Pownall set up the first flax mill in Foxton installing a stripper machine that he had designed. The flax industry thrived throughout New Zealand during the later years of the 19th century and trade through the port of Foxton increased. Foxton Became a borough in 1888 and in the 1890s a recovery in the flax milling business occured as the price of New Zealand hemp rose on the world markets due to a war in the Phillipines which had been a supplier of Manilla hemp to the world. At one time fiflty mills were operating within ten miles of Foxton. Sadly the boom did not last. Later in the 1870s, mills began producing the fibre. From then until the 1970s flax fibre was used for woolpacks, binder twine, fibrous plaster, lashings, upholsterers tow and carpet. 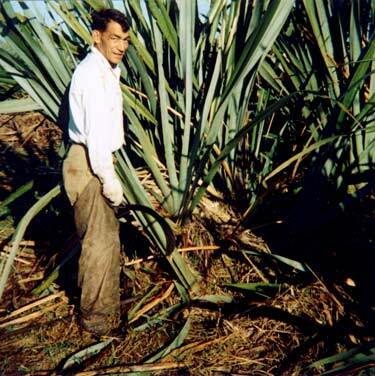 During the 1940s the Moutoa Estate swamp ws bought by the Government and planted in phormium tenax. The strain selected was Sieferts special, a strong growing variety resistant to the disease 'yellow leaf'. The depression of the 1930s almost killed off the flax industry but the government stepped in an established the New Zealand Woolpack and Textiles company. The company built a new factory and began producing woolpacks from flax fibre. During World War Two, gun mats were produced and after the war diversification into floor mats took place. The 1960s saw flax woolpacks losing their share of the market and less flax fibre was being used for floor coverings. Then complaints came from the Japanese about the quality of flax woolpacks. During the 20th century there was a gradual decline and the last mill in Foxton closed in 1973. In 1973 the woolpacks plant was sold to the firm of Stephens-Bremner who expanded the wool production. Wool had replaced flax as the town's 'saviour'. Flax was and still is plentiful in the Horowhenua. The Maori recognise over 50 varieties of flax each with its own name. All those with fibre so strong they could be drawn out in long ribbons without breaking were called Tihore while all others were known as Horo. The variety most in use was harakeke or swamp flax. This grows best not in the swamps but along the edges of streams, with its roots near running water. The leaves of the plant are arranged in fans and the leaf one of the strongest known, can take a strain of some 19 kilograms. The Foxton Flax stripping museum may be visited between 1pm - 3pm daily except for Good Friday, Christmas or Anzac days.